Break Away Farm. Your natural living journey begins in the Valley Farm Community, a peaceful equestrian setting near Waxhaw and Wesley Chapel, North Carolina. Tucked away in this private site is Break Away Farm, a 10+ acre manicured estate. With a backdrop of horse farms, this property is an ideal gentleman’s farm, designed and maintained to accommodate any number of dreams and uses. Bring your favorite animal(s), and begin your journey. This modern home has an old-world ambiance grounded in its sundry warm spaces, connecting living areas, assortment of fireplaces (four including the master suite), and several private get-away spots. With an eye to outdoor living, a screen porch is open to the great room, office and breakfast area and a large deck adjoins the master suite and great room. Combining casual living with formal, the walk from the multi-purpose mud room features a dining room well suited for those special holiday events, a gourmet kitchen and adjacent breakfast space, on to the living room, an ideal quiet time room next to the great room, well designed for more spirited events, and culminates in a private, spacious master suite. The kitchen is a model of efficiency and grace; the profession grade stainless steel appliances make preparing a snack or a gourmet meal a simple task. The generous master suite wing offers a fireplace, built-in bookcases/cabinets and a spa-like bath, including a claw foot tub surrounded by windows. In addition to the master, the 3,771sf home has three guest bedrooms upstairs and access to a copious amount of attic storage space. One of the bedroom suites offers extraordinary privacy; the primary access from stairs located in the rear corridor near the mud room. Additionally, there is a second living quarters with full bath and kitchenette over the garage. A two-car garage features a self-contained, heated and air conditioned shop that would make Tim Taylor or his arch enemy Bob Vila envious. The old-world ambiance is particularly evident in the grounds surrounding the home. Mature hardwoods, landscaping with stone walls, walkways and private gardens, landscape lighting and a nature preserve backyard all support the estate designation. A gated entrance with large stone columns further points to the fact that this is a special place. The care and stewardship of the property by the current owners is evident everywhere you look. To accommodate your horses and/or other animals are four pastures/paddocks, 4-stall barn with hay loft, run-in shed and 4-bay equipment shed, and a lighted 50’ x 125’ arena with sprinkler. Should horses be your dream, in addition to your own trails, you can access trails adjoining the property; Mineral Springs Greenway is nearby as well as the 1,100 acre Cane Creek park, both with an abundance of riding trails. 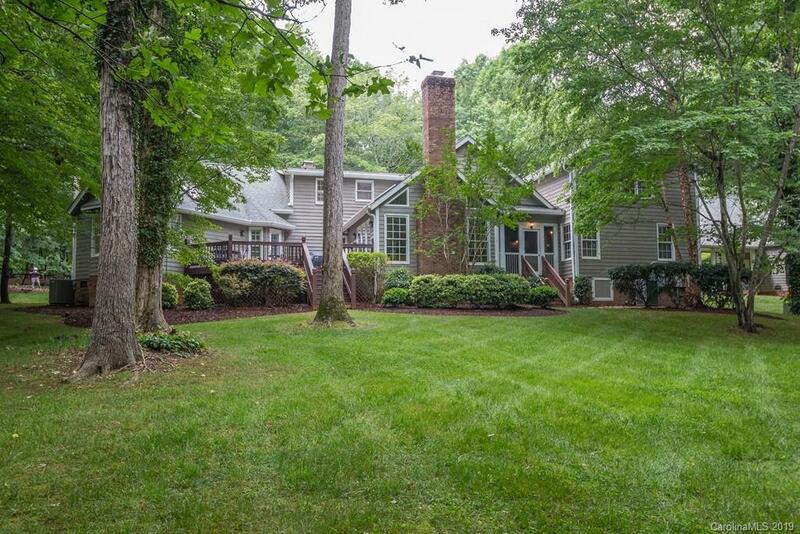 Located just minutes from the quaint village of Waxhaw the area is highly desirable, both for its growth and charm. It is an area rich with history, named for the Waxhaws, the indigenous Native American tribe that lived there prior to colonial settlement. The Howie gold mine was located just outside the current town limits. The mine was active for approximately a century and at its closing in 1942 the mine produced two thirty-pound gold bricks each month. Modern exploration shows gold deposits in the area, who knows what you may find? Andrew Jackson, soldier, statesman and seventh president of the U.S. was born in the area. His exact birth place is the still the subject of debate; regardless the region was home to this colorful American hero during his youth. The region is a rare place that honors the past, respects the present and plans for the future. A premium is placed on natural space; come find yours at Break Away farm, 2705 Valley Farm Road, Waxhaw, NC.